WhiteCloud Software Ltd. announced the release of version 5.0 of EAComposer. An innovative and easy-to-use enterprise architecture tool. Use it to manage your IT landscape and technology portfolio. Delivered as a pure SaaS product: cloud hosted with a subscription based license model. - Component Metrics: You are now able to define metrics for components (using the Metamodel) and then store metric values with the component. This feature is similar to defining extended properties but metrics are always numeric and contain a time indicator (weekly, monthly, quarterly, annually). E.g. Annual License Cost could be a metric and for each year you can store a value. Another example could be an # Active Logins metric and then can store the monthly # of active logins. We have also added Metrics support to our REST API as well as a our Excel Import feature. - Chart Reports: We have added a series of new reporting widgets all around Chart reports: Pie Charts, Line Charts, Bar Charts, Column Charts and Range Charts. 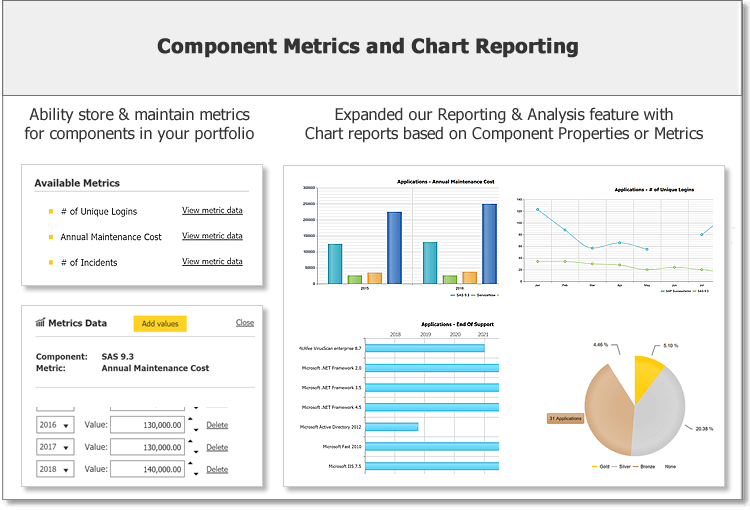 Chart reports are based on Extended Properties or Metrics values. These charts can be exported to PDF or PNG and also be published to the Reference and Standards Libraries. We still have a few more minor tweaks planned for the new Chart reports but the core feature and functionality is ready for usage. Please visit the Reporting & Analysis section for more details. A few chart examples are shown below. (please note if your email client is blocking images please select to "load/display images" to see the sample chart reports).